Stefen Klaverdal is rapidly carving a niche for himself as a composer of music that mixes chamber music and dance music conventions. If what he does is crossover (and I'm not entirely convinced that it is) then it is at the radical end of the spectrum. The relationship between the live performers and electronica is never ambivalent, and a clear timbral distinction is almost always maintained. This allows him to avoid many of the aesthetic problems of crossover, and where much of the more commercial music of this sort suffers from being neither one thing nor the other, Klaverdal always ensures that the legacies of both the classical and the dance music are clearly perceived. Having said that, he regularly takes his music right to the edge of good taste and seems to delight in the almost constant threat of kitsch. But he knows what he is doing, and the artistic integrity of the results is never seriously threatened. The two works on this disc present two facets of Klaverdal's work. In 'The Sacred Family', chamber music conventions predominate, not least through the use of string quartet, albeit with accompanying electronics. 'Revelation Pieces' tip the balance the other way, each is for one or two instrumentalists with electronic backing, but here the electronics have the foreground, or at least compete on equal terms with the soloist. But the balance between live and electronic music is in a constant state of flux in both works, and it is rarely clear which will triumph from the struggle. Klaverdal has found some powerful and sympathetic advocates in the Tippet Quartet. Those who have heard the quartet's recordings of their namesake's works for Naxos (read my review of vol. 2 here) will know that their musical sensibilities are ideal for this sort of project. 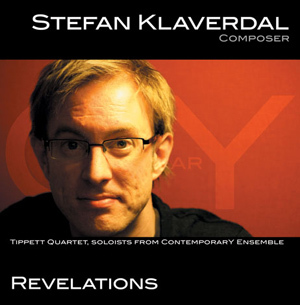 In common with Tippet, Klaverdal is a composer who constantly wrestles with tradition, yet mixes the new and the old with such fluency that the whole process seems almost intuitive. The Tippet Quartet know just how much convention to introduce at any given point. The opening of 'The Sacred Family' for example, is painted in broad tonal strokes reminiscent of middle period Beethoven, which is just how they play it. But then later, and admittedly in stark contrast to the work of Michael Tippet, dance music electronica is introduced and the instrumental parts respond by moving to minimalist textures, creating intense textures but without saturating the music with new ideas. The players manage to maintain the energy and logic of the music, even in the face of these stylistic shifts. There are one or two slips of intonation, particularly in the final fortissimo passages of the work, but otherwise this is a fine reading. 'Revelation pieces' is a series of works for one or two instruments and electronics, each inspired by a verse from the book or Revelation. (Don't be put off by all the biblical references by the way, the music is much more fun and lively than they would lead you to expect.) The four movements here are for trumpet and percussion, bass clarinet, recorder, and percussion duet. The music is very rhythmically focussed, and the solo parts are mostly based on fast rhythmis pulses spiced up with unpredictable off beat accents. I have to confess that I don't keep up with the many trends in dance music these days, but the electronics here invariably put me in mind of Lemonjelly. So we are talking about lively, consonant textures, very little in the way of sustaining tones, and rhythms articulated through a range of beats and pulses resembling synthesised percussion. I wonder what logic informs Klaverdal's choice of solo instruments? Perhaps he is following Berio's example and is trying for a comprehensive survey of them all. To my ear, the trumpet movement is the most effective, if only because the sound of the trumpet has the most success in its competition with the electronics. When Klaverdal uses percussion, it seems to be as some sort of middle ground between the live and the electronic, but the results are usually indistinct. The recorder movement is fun. In this one the electronics are to the fore, and gradually build up from short, dissipated snatches into more continuous textures. The recorder plays a kind of obbligato over all this, always diatonic and based on four-square rhythms, but also continuously evolving in unpredictable ways. An interesting album then, and with plenty of musical ideas you won't find anywhere else. There is something curiously provisional about these pieces, as if each is a work in progress. No doubt Stefan Klaverdal has all sorts of ideas up his sleeve about the directions his future works are going to take. If he continues to produce music of this originality and energy, in should be fascinating journey.